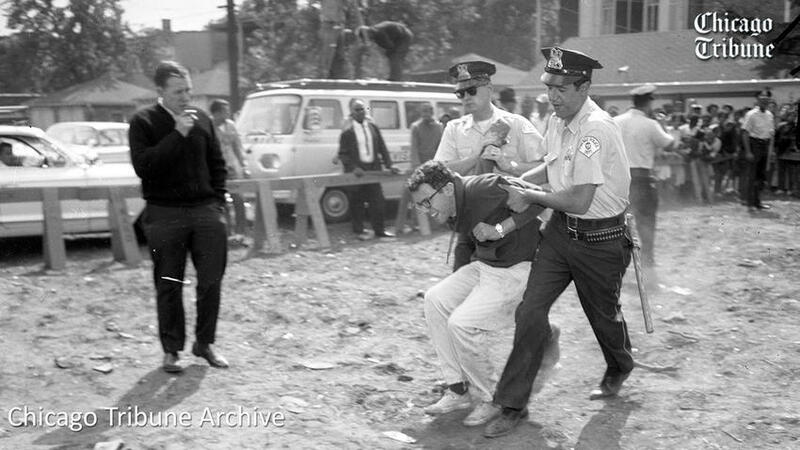 Is this Bernie Sanders being arrested? This entry was posted in Blog on February 15, 2016 by '63 Boycott. The Sanders campaign has confirmed that the video posted below is indeed of Bernie Sanders. “What sealed it was the watch the man is wearing; Mr. Sanders recalled owning a watch like that,” a senior advisor to the campaign told the New York Times. Thanks to the media response spurred by the posting of our footage, the Chicago Tribune dug up these acetate negatives from their archives. While a photo of Bernie Sanders captures the moment he was arrested, other photos flesh out the story of the protest. Parent organizer Rosie Simpson, whom we interviewed for our documentary, is shown here seeking permission to hold a prayer meeting at the mobile school site at 73rd and Lowe. For a great background on what was going on with the Willis Wagons and Englewood, read this story from the Chicago Reader. Help Kartemquin Films tell the story of this protest, as well as the great school boycott that happened two months later when over 200,000 children boycotted school. Please consider donating to our project. We plan to release the film in early 2017. 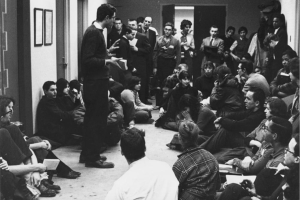 While Bernie Sanders’ participation in the Civil Rights movement has been of some debate recently, many Chicagoans remember him as a student organizer at the University of Chicago in the early 60s. Back in 2014, we asked people for help identifying this footage from 1963. It turned out to be an important protest in Englewood in the summer of 1963 at a site where Chicago Public Schools was planning to build an entire school out of Willis Wagons (mobile units) at 73rd and Lowe, between a railroad track and an alley. 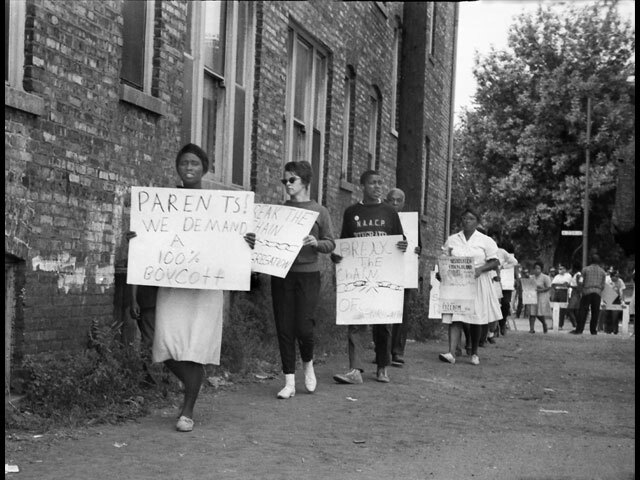 It was organized by parent Rosie Simpson and considered one of the major precursors to the great boycott in October, when over 200,000 students boycotted school in Chicago. 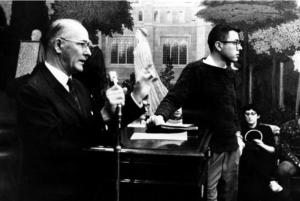 Last week, Mother Jones published an article about Bernie Sanders’ participation in the Congress of Racial Equality (CORE) and activism at University of Chicago. 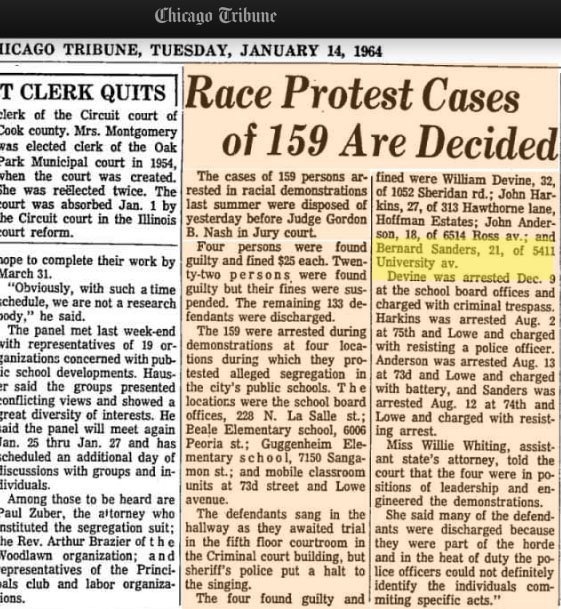 They included this newspaper clipping (right) from the Chicago Tribune, which states that 21-year-old Bernard Sanders was arrested at this same Englewood protest, at 74th and Lowe. He was later fined $25 for resisting arrest. So we looked back at our footage of the protest shot by Jerry Temaner, one of Kartemquin’s co-founders, where we see a man with striking similarities to young Bernie Sanders being arrested. Is it Bernie Sanders? Help us to confirm it. 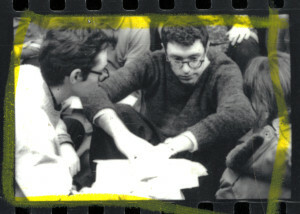 Here are some other photos we have found online of Bernie Sanders at the time. Three were taken by Danny Lyon, and the other is a photo from the 1964 yearbook of Gordon Quinn, the director of ’63 Boycott and graduate of University of Chicago. We had talked to a lot of the parents and we had gone to the Coordinating Council of Community Organizations asking them to support us if we had to protest and of course CORE (Congress on Racial Equality) was a part of that group and their members came out and by 10 o’clock that morning you had a lot of the CORE members out there laying down in front of the bulldozers. It rained most of the morning so we were muddy and they took us to the police station, they arrested 65 of us, and they kept us there and tried to ask us to give up our protest but we refused to so they put us in jail. The Presbyterian Church bailed us out that night. And so that evening when everyone got out of jail they had cleared all of the debris off the lot and the CORE members went out and decided that they were going to get all the garbage out of the community dumpsters, all kinds of garbage and put it back on the site, so they spent the night doing that. And for two weeks the construction trucks didn’t come anymore. When they did get to it two weeks later, they used those persons that were on public aid to clear the debris off the lot. And so we were glad to let them move it because by that time it was smelling so bad. The day of the March on Washington the Board of Education had a meeting and rescinded their recommendation on building that mobile classroom school. And interestingly enough, it was the first time that the Board of Education had rescinded any recommendation they had made. 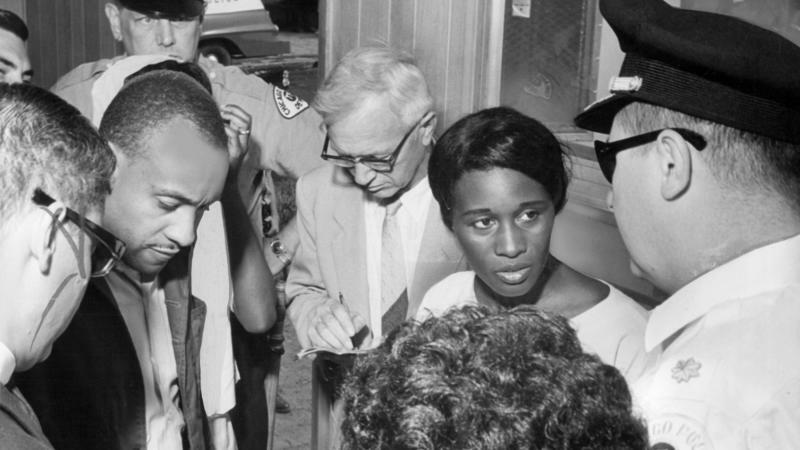 Rosie Simpson protests school inequality in Englewood, 1963. Education protests in Chicago have been making national headlines for the past few years, but the roots of these protests can be traced back to the early 1960’s and the citywide school boycott that emptied half of Chicago’s schools. 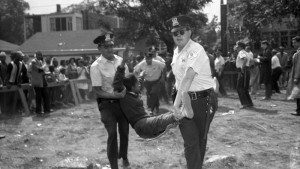 It was one of the largest Civil Rights demonstrations in the north. Despite the mandate of Brown vs. the Board of Education, Chicago Public Schools remained segregated and inadequately resourced. Overcrowded black schools sat blocks away from white schools with empty classrooms. To deal with the overflow but avoid integration, CPS Superintendent Benjamin Willis ordered the installment of mobile unit classrooms on the playgrounds and parking lots of these schools. 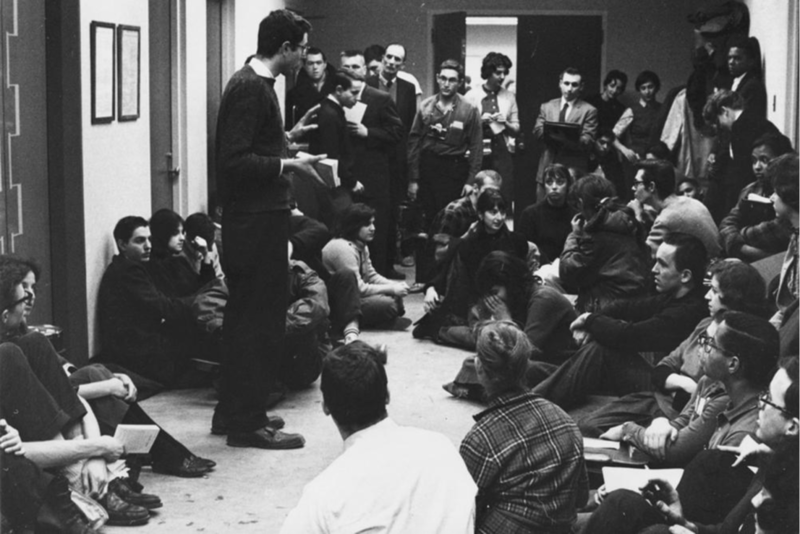 Dubbed “Willis Wagons,” they outraged the community, leading to a massive boycott by 250,000 students. Other cities soon planned similar demonstrations. The ’63 Boycott film and web project aim to engage the public with the present day implications of this history. For updates on the project and to see the finished film later this year, join our mailing list. Thanks we will fix that. Will you also fix this? The bottom right picture is absolutely Bernie Sanders. We know because of this newspaper article from the Chicago tribune. Read the whole article. 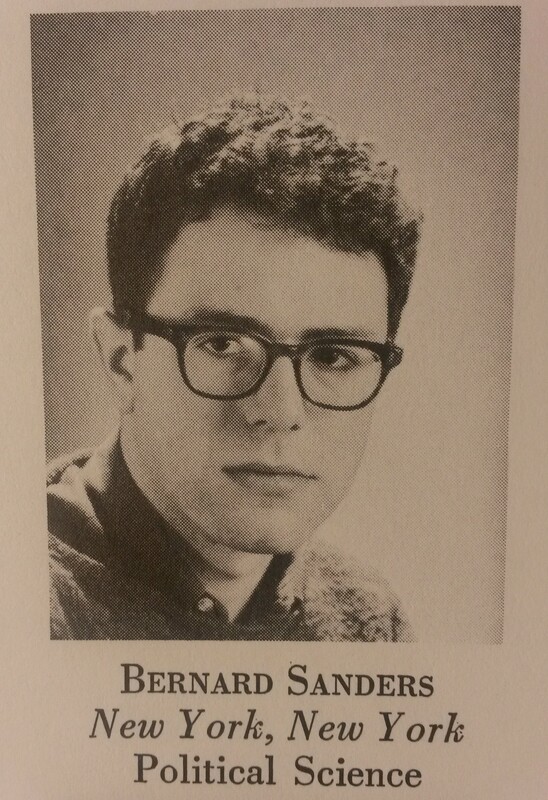 If you arrange the still of Sanders sitting on the floor, next to his yearbook photo, next to the frame of the arrest, so you can see them all on the screen at the same time, there is not really any ambiguity. It is the same guy. I mean, if human beings can recognize faces in photographs, then those are three pictures of the same person. Just a 56 yo white haired woman who respects the truth. Snopes has it as “probably not” – that doesn’t equal not FALSE – it just hasn’t been confirmed yet. Can you post link to the snopes article? I can’t find it. Thanks. You should be aware that Sanders was not present at the Selma march (depicted in the top left picture), but wás in fact present at the March on Washington. I hope you’ll include these facts into your article! As for the video, can you answer me this: The video says 73rd. The newspaper article says 74th. What were the sources of either streetname? Thanks we will correct the info you mention. As for the address discrepancy, a few things. 1) the original Tribune article says one of the young people arrested was at &5th and Lowe, one at 73rd and Lowe, and one at 74th and Lowe, so they were all relatively closeby. 2) According to our interview with parent organizer Rosie Simpson, she told us the protest was at 73rd and Lowe. This article in the Tribune mentions the 73rd and Lowe site ( bit.ly/1oHAj8b ), and in our interview with Simpson, she referred to the location being between a railroad track and an alley. So my guess is the protest site occupied space between 75th and 73rd, or in that vicinity they were marching. There is no record of a different protest against school segregation in August of 1963 at 74th and Lowe, or 75th and Lowe, so we figure it must be the same one. Thanks so much for the response! And especially the correction. I’m going to guess this page will be getting a lot of attention shortly and I don’t want Jonathan Capehart’s misinformation lying around. Sean King posted it on NY Daily News, so your video is getting traction. But I regret King not waiting for proof either way. This is amazing if it turns out to be Sanders. I’d suggest posting as many still frames (at the highest rez) as you can create, and then you can sit back and let the interweb work its crowdsourced magic. (See, e.g., the “forensic ear shape analysis” that people did for the Capehart Hoax). Hi again – realized that it was poor form to lob that suggestion without pitching in myself, so just sent a donation in case it might help with the effort. I’m guessing that other Bernie supporters might be similarly inclined (they’re getting something of a reputation for that whole “pitching in” thing). Any others out there? Check out the discussion here. 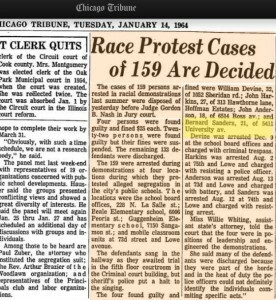 The newspaper clipping states that Bernie’s arrest was on Aug 12, exactly a week after the stated date the footage was taken (from your website: http://63boycott.kartemquin.com/blog/boycotter-stories/help-us-identify-people-in-willis-wagon-protest/). Is that date only for the *start* of protests, or does that definitely mean it’s not Bernie in the footage? I believe the footage may be dated wrong. We are trying to confirm that. It was an ongoing protest through August that took place on various days. We don’t know which day the footage is from exactly, nor exact dates of the protest, but we’ll try to find out. Awesome, appreciate the response. Looking forward to hearing your findings! It’s a very interesting piece of history! 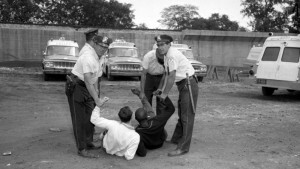 Please compare the watch Bernie is wearing in the still photo (seated) with the watch being worn by the youth being arrested in the video. Not conclusive, but pretty darned dead-ringer match. I’d give the video 99+% probability. I had not noticed. Wow. Hi! Very interesting film material, thank you very much for bringing it to light. That said, this is clearly a low-quality film scan to a low-quality videotape (guessing VHS, Beta or U-matic?). Since the whole world is trying to scrutinize individual frames, I’m positive it would be useful to get this reel properly scanned on a modern high-resolution scanner. Is this an option, or is the original film lost? There is a world of detail in these frames that we’re not seeing. Thank you! Also note that there’s a cameraman with a far superior Bolex-Paillard 16mm camera, presumably working for TV news. If _that_ footage survives, it could be cinema-quality. I savor, result in I found just what I used to be taking a look for. I found another possible film segment from the restored film “The March” at the National Archives. This is one year later at the MLK march August 28, 1963 in D.C. At time point 17:00 a man walks by who bears a striking resemblance to these other photos of Sanders from 1962. Could this be him as well? If available, police records and photos of who was arrested at this location could be used in a process of elimination to rule out other possible persons. Certainly looks to be Bernie Sanders and he was definitely resisting arrest in the video. Court proceedings might be useful if they describe how he was resisting arrest, such as resisting being put in police vehicle. HOW DO WE KNOW THAT HE WAS THERE BOYCOTTING? WE HAVE NOOOOO IDEA WHY HE GOT ARRESTED. BOYCOTT? WHO KNOWS? his right, the photo’s left is Bob Brown who was very active. The Tribune at the time published the mug shots of those arrested as a center section to the paper. Bob is there as I am and a batch more. I think I have a copy of it and I’ll look to see if Sanders was shown. Thanks for showing us this! Looks like we have a confirmation. Snopes is notoriously unreliable as a source of truth. I look at Factcheck.org from the Annenberg School of Journalism. I have no doubt a ton of anti-Bernies will go the birthed route and say the article in the Chicago paper was planted just in case 45 years later Bernie ran for national office. Couldn’t you just ask Bernie if that’s he? He won’t lie. It looks like the video was taken from on top of the van in the photo. Two people with a tripod, with camera just out of frame. Didn’t notice that until I saw a color version of the photo.